The doorman is accused of sexually harassing Emily White and making comments about her breasts. 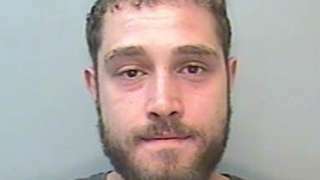 The 42-year-old builder who was arrested with two French nationals was well-known among Newquay surfers. A30 Cornwall westbound severe disruption, between B3274 and A39. A30 Cornwall - A30 closed and queuing traffic westbound between Victoria and Indian Queens, because of an overturned car. Diversion in operation - Eastbound traffic to take the A39 to Wadebridge and then A389 to A30 Bodmin. WB traffic follow same route in reverse. Gil Winfield, 48, is warned he could be jailed when he is sentenced in September. One or two light showers are possible overnight on Tuesday but, in general, there will be lots of dry weather with some clear spells. Light or moderate south-westerly winds. Minimum temperature: 8 to 13C (46 to 56F). There will be some large areas of cloud at times on Wednesday but there will be sunny intervals as well. A few light showers are possible too, especially later in the day. Maximum temperature: 18 to 21C (64 to 70F). Passengers for the ferry between Penzance and the Isles of Scilly have been told to "check-in as normal" on Wednesday by the company that runs the service. This is after the Tuesday crossings of the Scillonian were cancelled because of an electrical fault. Hundreds of passengers were delayed for three hours on St Mary's on Monday night after the ship developed the fault. The Isles of Scilly Steamship Company says the service is scheduled to depart Penzance at 0915. 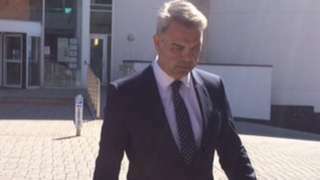 The former partner of Devon and Cornwall's police and crime commissioner (PCC) has been warned he faces jail for assaulting and stalking her. Forty-eight-year-old Gil Winfield, of Cricketfield Road, Torquay, attacked Alison Hernandez twice during their relationship and harassed her when it broke down, Exeter Crown Court heard. He had previously pleaded guilty to two counts of assault by beating and one of stalking when he appeared at Plymouth Magistrates Court in April. Earlier today (Tuesday) he was in court attempting to change these pleas but was refused permission to do so. He was released on bail until his next court appearance, due in September, but was warned by the judge "there is a risk of immediate imprisonment". Conservative Ms Hernandez (pictured) was elected as PCC in May 2016. A multimillion-pound link road in Plymouth has been given the green light, the city council says. It will connect William Prance Road in Derriford with the junction of Forder Valley Road and Novorossiysk Road, providing "an additional route from the east of the city to the north". The council said it was an "important milestone" which would help drivers avoid the Manadon roundabout and Tavistock Road. The Department for Transport has earmarked £22.5m towards the £38m scheme. Another £4.5m is coming from Highways England. Work is due to get under way early next year with the main construction planned to take about two years. More than 30 shops, restaurants and pubs across Penzance are currently using two-way radios as part of the town's Shop Watch scheme. Local police said on Facebook said that the neighbourhood policing team also had two radios to monitor and use as part of the scheme, which aimed to help businesses share information "amongst themselves should any of them have a theft or attempted theft occur, or simply to warn other users that a prolific shoplifter may be about." The 31 businesses taking part also display a sticker in their window to show they are part of it. Officers said the scheme had been reintroduced "over the past several months" in conjunction with the Penzance BID - the local business improvement district. They added: "We have noticed great use of the system already whereby shoplifters have been deterred and even wanted persons have been caught." A local businessman has shared pictures of a special customer who took part at his axe-throwing activity at a Cornish festival over the weekend. Homeland and Billions star Damien Lewis showed up at Jay Dorman's base at the Port Eliot Festival, St Germans, on Sunday. Mr Dorman runs Canoe Cornwall which hosts various adventure activities. He said the actor, who got involved along with his family, was "Good fun and very engaging - very tolerant of people coming up and saying hi and a real family man." A rail passenger from Devon says South Western Railway (SWR) "don't care" about people at local stations. Strikes on the service have meant some places in the county are not getting replacement bus services - much to the dismay of those who use it. SWR says it can't source enough replacement buses to serve Pinhoe, Cranbrook, Whimple and Feniton on strike days but passengers can use their tickets on local buses. Tuesday is the third day of strikes by the National Union of Rail, Maritime and Transport Workers (RMT) over the role of guards. Video caption: Rail passengers from five stations in Devon say they're being abandoned during strikes.Rail passengers from five stations in Devon say they're being abandoned during strikes. The most powerful fans in England? 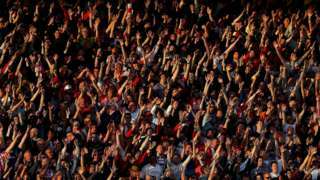 Having started the process that led to their manager leaving after 12 years, are Exeter City fans the most powerful in England? A judge says Nicholas Webber-Dollery used his "teeth as a weapon" during the attack in a nightclub. Hit BBC drama Poldark has been slammed by an animal welfare charity over its use of a monkey after a recent episode of Poldark in a scene of a primate entertaining crowds at a fair. On the A390 between Gunnislake and Gulworthy, there are reports of a broken-down tractor that has lost a big round hay bale blocking the road. More details have emerged about two teenage girls who were hospitalised after taking a mystery drug in Bodmin. 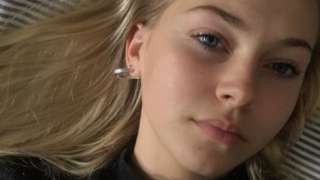 The girls had been at a house party which "spilled out on to the street" when a 17-year-old girl suffered a "fairly substantial reaction" to the unknown substance, Acting Ch Insp Julian Morris from Liskeard Police told the BBC. Her "prognosis is now good" and she is due to be discharged from hospital this afternoon, he said. The 16-year-old girl she was with was discharged on Monday. The substance is being tested but it is believed it might have been MDMA, or ecstacy, he added. We are making inquiries as to where they got the drugs from and we'd like to warn others not to take part in substance misuse". A390 Cornwall both ways severe disruption, between Under Road and B3257. A390 Cornwall - A390 in Gunnislake blocked and slow traffic in both directions between the Under Road junction and the B3257 junction, because of a shed load of hay. Approach with care. The Tuesday crossing of the Scillonian ferry from Cornwall to the Isles of Scilly has been cancelled because of continuing work to deal with an electrical fault on board the vessel. Hundreds of passengers were delayed for three hours on the Isles of Scilly on Monday night after the ship developed the fault. Engineers were flown out to fix the problem while passengers were looked after by local businesses. The vessel later returned to Penzance. Managers said the fault had been identified as being in "back-up emergency batteries" and electricians were "doing all they can to resolve the fault to ensure that the vessel returns to service a quickly as possible". The majority of passengers booked on to Tuesday's sailing had been "transferred to Skybus and island helicopter services from Land's End Airport and our travel centre representatives are currently making contact with the remainder of today's passengers". A mother has said beach signs about water quality need to be "bigger and more obvious" after her daughter got sick from swimming at a beach in north Devon due to the recent hot spell. She was diagnosed with cryptosporidium after her swim at Wildersmouth Beach in Ilfracombe. North Devon Council said signs at the beach are in line with industry standards.